President Donald Trump’s super PAC has spent hundreds of thousands of dollars denouncing “chain migration,” a term alleging that if one immigrant is allowed to come into the United States, their family will follow. Vice President Mike Pence, however, is the perfect example of exactly that. A post by genealogical researcher Megan Smolenyak revealed that Pence’s favorite grandfather he’s fond of mentioning was actually a migrant worker like the many people he attacks today. Pence’s grandfather, Richard Cawley, was born on February 7, 1903 in Doocastle, Ireland according to records that show an uncle registered the child’s birth. The uncle had to do it because Cowley’s father was working in Scotland at the time. It was typical of the time for workers from Ireland to seek work in other countries so they could send money back to their families. Just as many immigrants in the United States do today. Records reveal the marriage to begin with was a little slapdash with their first child being born just four days later. The chain migration for the Pence ancestors began with his grandfather and four siblings who came to America through Ellis Island between 1915 and 1929. His brother James came to Illinois and then helped brother Richard, who helped brother Thomas, who helped their sisters. 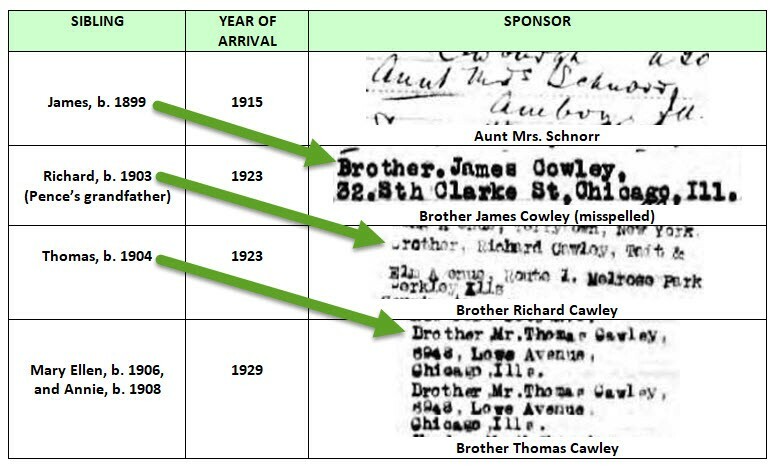 Chain migration pattern of Mike Pence’s grandfather (Richard) and his siblings via genealogical researcher Megan Smolenyak/Medium. Pence’s grandfather arrived at Ellis Island in 1923, married in 1930 and quickly had two daughters (1931 and 1931). The father of Pence’s grandfather Richard who had been traveling back and forth between Ireland and Scotland was all that was left of the family. While gone, his wife died and his children had all left Ireland for the United States. Not being able to make the journey, he died alone without help from his family at Nazareth House, Sligo, which operated primarily as an orphanage. See the full story for the screen captures of immigration information and public records on the Pence family at Medium.